When it comes to the creative process, one should admire the ambition. When reading reviews of artistic endeavours, it seems that sometimes writers appear to forget that they are critiquing the efforts of a crew that have clearly worked hard to attempt to bring together the vision of a screenwriter or director. A crew who have been brought together in order help set said vision alive. It’s easy to insult and pull apart a film. We forget to give credit to ambitious attempts. I admire the ambition of Ben Charles Edwards’ debut work; Set The Thames on Fire. I respect a filmmaker and crew looking to give us something different to observe and watch. We are in an age in which the recycling of product is placed over attempts at originality. This film is original. I respect that. However, I did not find this film enjoyable. 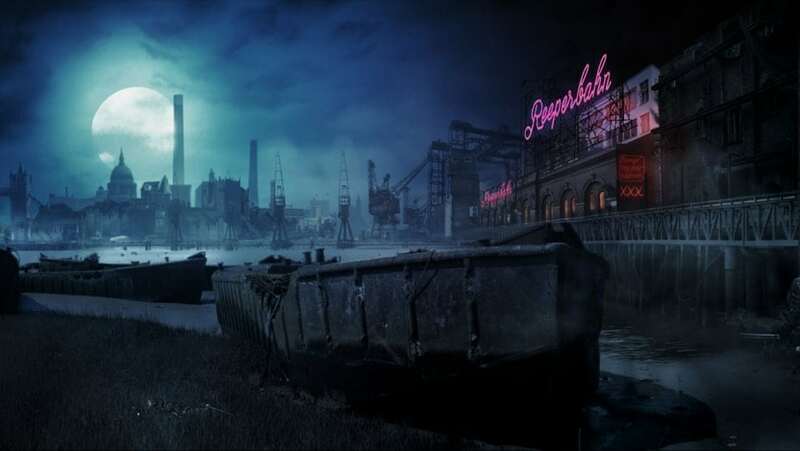 Set in a dystopian future, which see the banks of the Thames overflowing and flooding the now desolate streets of London. Everyone who inhabits the city reeks of desperation. This includes our two down on their luck protagonists; Art and Sal. These two lost souls find a kinship in spite of their luckless existence. Sal suggests they flee to Eygpt, Art reluctantly agrees, but the two must navigate this haphazard world of corrupt Impresario’s, aggressive drug sniffing goons and tarot readers who predict certain doom. If there is one area of this film that is difficult to fault, it’s with its visual flair. This is a remarkable looking piece with visuals and set design which is very reminiscent of the works of Terry Gilliam. While this small independent may not have the budget to compete with large-scale features, the keen eye of the filmmakers ensures that such an aspect need not matter. Edward’s builds a visually inventive world with a keen eye for detail. It is in the film look in which the filmmaker’s sense of ambition really stands out. The problem lies in the film’s lack of narrative drive. It builds a beautiful world but has no desire to connect the audience to it. To say a film has unlikable characters is often considered a clichéd response, yet within Set the Thames on Fire, we have no real reason to hold any concern for the plight of the protagonists. This is not the fault of the young actors who do what they can with the bleak material given. The film’s screenplay struggles to give the story any real entry point. Nor does it bother to detail the world fully. We are introduced to future pop stars, but not given any reason for why we waste a scene on them. Instead, the film is more concentrated on delivering the kind flowery dialogue that comes across more obnoxious than smart. Be it long-winded monologues from the older cast members to the portentous narration that rings throughout the film. Set the Thames on Fire never gives us a true reason to actually care about what’s occurring on the screen. The only element of provocation is the film’s homosexual undertones that run throughout the film. Set the Thames on Fire seems to put across the idea that homosexuality is somewhat perverse, a frustration when the film’s main bromance is so underdeveloped. Having a coked up Noel Fielding demanding aggressive sexual acts be done to him, probably would have been more bearable if the film’s attitude to homosexuality wasn’t so demoralising overall. Set the Thames on Fire is mostly disheartening all over to be fair. Its world is well built, but never does the film give us any vested points of interest. Despite this, I’m still glad that someone was willing to take a shot on a film that dared to be different. It’s hard to think of another film like this. Its attempt at melding bleak black comedy and sci-fi by way of Rosencrantz & Guildenstern Are Dead (1990), often falls flat and the film doesn’t really have too much to say, despite it’s , but it’s important that in spite of this, the filmmakers keep hold of their ambition. Something may come from it.